Home › Science › How do tornadoes form? Tornadoes are ferocious and dangerous storms. They whirl and spin like wooden toy tops, obviously not in the same category of mayhem and destruction, but still, it’s a neat comparison. Tornadoes have the power to destroy anything that gets in their way. The tornado is like a whirlpool of wind that develops from a thunderstorm. Thunderstorms develop when warm, moist air rises and cools. This creates clouds. Water vapor condenses and releases heat. This release of heat creates the energy in a thunderstorm. Under certain conditions, when the air moving up into the cloud is very strong, a tornado can develop. Look at the infographic below. Follow the captions underneath each picture for a step by step recipe to create a twister. The whirling winds are like a spinning column of air that comes down from the thundercloud. The winds can be as strong as 300 miles per hour (483 kilometers per hour). When the tornado reaches the ground, the whirling winds can cause a great deal of damage. The tornado on the ground follows the same path as the thundercloud. The larger tornadoes can travel fast and can last for hours. View the infographic by Adam Wood and the Weatherwizkids. Notice the chart on the lower left corner. 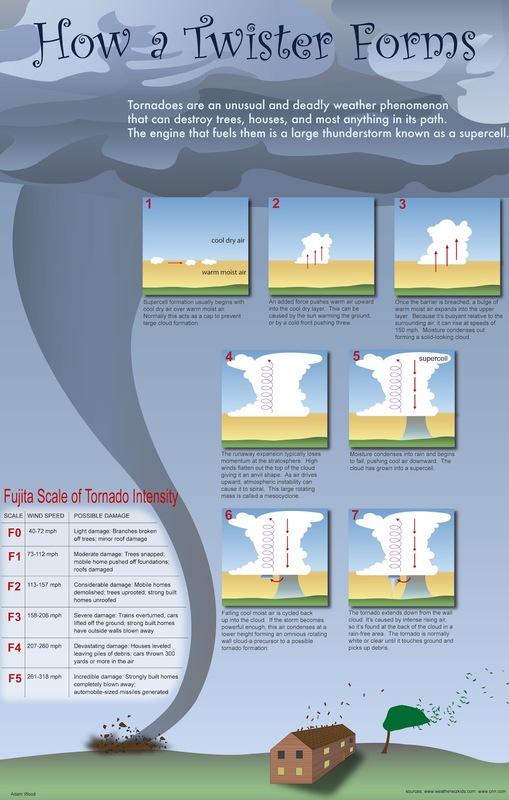 What details can you learn from Fujita’s Scale of Tornado Intensity? In the video Tornadoes 101, what region of the United States will you find the most tornado activity? Explore the reasons behind this interesting weather system. one thing you can do is go down to your bassment and get in a bathtub and put a matress over you. The matress will prevent objects from falling on you and the bathtub is so you wont get sucked up in the twister. Did you know that hurricane’s are giant storm’s prowling tropical sea’s. Hurricane andrew was the damge hurricane. When I used to live in Missouri, i got used to tornados real quick. I would always go tell my parents. Then, run to the basement. A cyclone kind of looks like a tornado. How would you be able to distinguish a cyclone from a tornado? Yes I agree with myself because tornadoes and tsunami do a lot of damge. Wow…I can’t belive how bad that Tsunami was in Japan. I know I feel so bad for the people in Japan they must of been scared for life. I FEEL SOOO BAD I HOPE THERE OK.
Did you know that the Tsunami in Japan in March of 2011 was caused by an 8.9-magnitude earthquake. The Tsunami killed more than 15,000 people and more than 3,000 people are still missing. Yeah. I believe you are talking about the events and the link below. Did you know that our U.S. coastlines are still receiving debris from this disaster. With relief efforts from all over the world, the cities in Japan are working hard to get back to normal life once more. Back to tornadoes, what have you learned about them and how they work? i wonder how there familys feel.